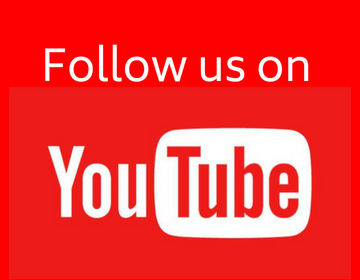 (1) The word ‘data’ means information. Its exact dictionary meaning is" given facts". (2) Statistical data are of two types (i) primary (ii)secondary. Example: Population census reports are primary data because these are collected, compiled and published by the population census organization. (3) The number of times an observation occurs in the given data is called the frequency of the observation. For Example: If 4 students get 68 marks, then we say that the frequency of 68 is 4. If this is done for all the observations and the data is rearranged from the lowest to the highest value; frequency distribution is obtained. 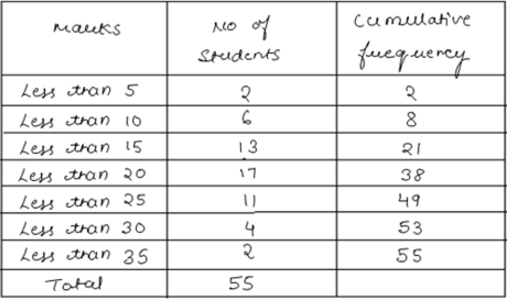 Prepare a frequency distribution with class size of 10 marks. (5) In a discrete frequency distribution the cumulative frequency of a particular value of the variable is the total of all the frequencies of the values of the variable which are less than or equal to the particular value. 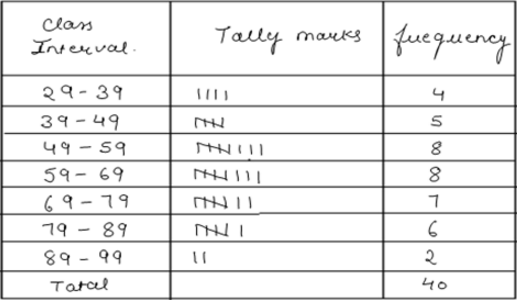 Frequency Distribution: Construction of this from the given raw data is done by the use of the method of tally marks. In the first column of the frequency table, we write all the possible values of the variable from the lowest to the highest. Cumulative Frequency: It is corresponding to a class is the sum of all frequencies up to end including that class. A table which shows the commutative frequencies over various classes is called a cumulative frequency distribution table. (6) A table which displays the manner is which cumulative frequency are distributed over various classes is called a cumulative frequency distribution or cumulative frequency table. 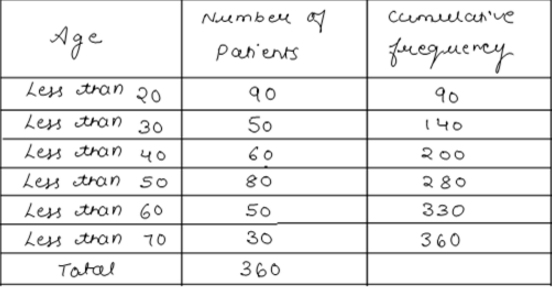 For Example: The marks scored by 55 students in a test are given below: Prepare a cumulative frequency table.